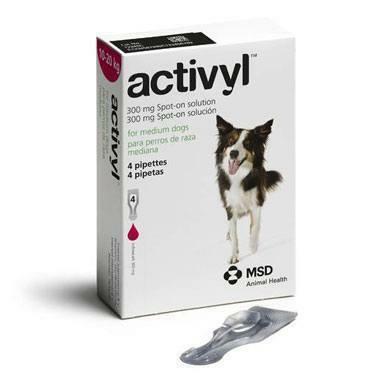 Activyl Spot-On for Medium Dogs 22-44 lbs is a effective spot-on solution for the treatment of flea infestations in medium-sized dogs. The solution contains the active substance Indoxacarb which works using a process called bio-activation. This mode of action uses enzymes inside the flea to activate and produce an active compound that interferes with the flea's nervous system. Once activated, Activyl will not only kill adult fleas but also break the flea life cycle and prevent eggs developing into larvae. Each 1.54ml pipette contains 300.30mg Indoxacarb. It is also quick-drying, fragrance-free, water fast on dogs, and remains effective even after bathing. Dogs and puppies over 1.5 kg from 8 weeks of age.